So Bekah’s little post in the “spouting off” category has drawn nearly 100 comments, which is a record here at Femina. I’m trying to think of an appropriate prize for her if she gets to 100….any ideas? All I can think of is a gift my sister-in-law (who was living in Istanbul at the time) sent one Christmas. The whole extended family was assembled on Christmas Eve to open gifts. My mother-in-law opened hers, and it was a dark velvet tea cozy tastefully embellished with gold embroidery. Without a moment’s hesitation, my brother-in-law popped it up on his head (it looked just the shape of a bishop’s hat) and burst outÂ singing “I Come to the Garden Alone.” Memorable. I had not the slightest notion Bekah would draw so much fire for her observations about Canterbury, especially since the world-wide web is such a big place. But apparently it’s a small world after all. Kudos to Bekah! What ever shall we have her spout off about next? The Vatican? I definitely think she deserves a prize! I would love to hear more spout offs, if she can take the potential heat. I wouldn’t be able to, myself. My, my, people become odd on the internet. 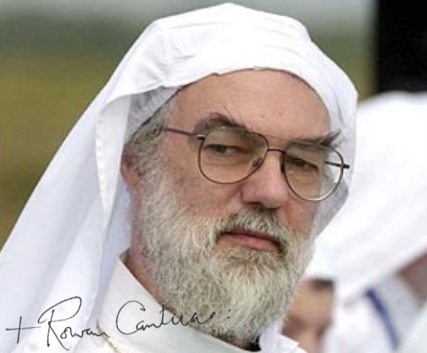 How ’bout an autographed picture of Rowan Williams in full druid regalia? In between we can have a great time eating real Mexican food, and visiting some great places around here! Great fabric is my choice for her gift. 🙂 She certainly is entertaining and witty! Blessings to you all. There is truly a time for everything. I haven’t laughed like that in awhile. Thank-you. We have a lovely holographic Jesus-turns-into-Mary…hmmm, not sure what word goes next. Painting? Print? Atrocity? Whatever it is called, you might want to look for something like that for Bekah’s prize. It’s quite idolatrous. Whoops, that was supposed to be “glow like a night light”. I would like to offer a prize. Bekah was sweet enough to give me a skirty for Payton from her first ever batch of manufactured skirtyâ€™s and I have always want to return the kindness. This may not be what you are going for, as is does sound like you are thinking more of a satire gift, but I would love to donate a prize from my shop. I have a couple table runners, or boyâ€™s ties that I would love to let Bekah choose from, if you thought it a good prize. I would take no offence if this prize was not up your ally, but if you like the idea let me know. I think since Valerie left a number of those 100 comments (and by doing so encouraged others to comment) her prize idea should have special consideration. I’ve laughed all day at the thought of Valerie’s prize. 🙂 If only such an image could be posted on fb . . .
Valerie, stop making me snort into my coffee. Whoa, look at those eyebrows. That’s something. Maybe he should win a prize for those.